One outstanding and unsolved challenge in ecology and evolutionary biology is to understand how pollinator diversity affects plant performance and fitness, and to discover the reasons why generalization is so frequent in nature. We have started a research program devoted to explore the effect of pollinator diversity in plant reproduction and recruitment and population persistence. We are using community ecology methodology (rarefaction curves, numeric estimates of richness) to measure pollinator diversity. In a preliminary study we have found that plants in populations with intermediate levels of pollinator diversity produce more seeds and have higher seedling establishement than plants in populations with either low or high pollinators diversity. Our hypothesis is that there is an optimal, intermiediate level of generalization. Gómez JM, Bosch J, Perfectti F, Fernandez J, Abdelaziz M. 2007. Perfectti F, Gómez JM, Bosch J. 2009. 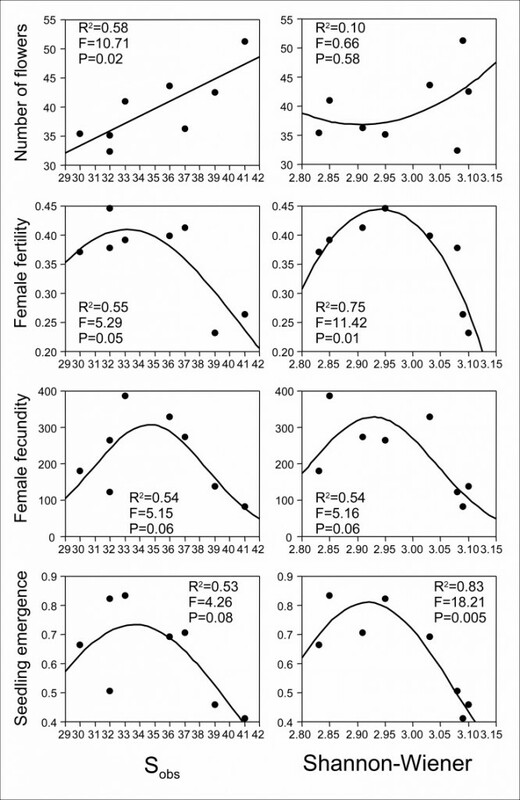 The functional consequences of diversity in plant-pollinator interactions.